There are six different sets of attributes that make up a given piece of armor: Condition, Armor Rating, Effectiveness, Special Protection, Vulnerability, and Encumbrance. Let's go through each of these using these freshly crafted bone gloves (fig. 1) as an example. Condition is a measure of how much damage the armor can absorb before becoming useless. It is expressed as two numbers, the current value and the maximum value. In fig.1, the bone gloves are in perfect condition as both the current value and the maximum value are 8722. The amount of damage taken by the gloves is equal to a fraction of the damage that penetrates its defenses. Once at 0 condition, the armor no longer provides protection. An armor repair tool can be used to restore condition but this will reduce the armor's maximum condition and may destroy the armor entirely. Armor whose maximum condition is 10 or less may not be repaired. Our bone gloves have an Armor Rating of Light. Armor Ratings have four possible values: None, Light, Medium, and Heavy (sometimes referred to as AR 0, 1, 2 and 3). Personal armor always falls into the Light category with None being reserved for those with no armor and the other two values being reserved for armored vehicles and especially nasty critters. If the armor's Armor Rating is equal to the weapon's Armor Piercing, there is no modification to the damage. If the Armor Rating is higher, however, there is a 50% reduction for each level of difference. On the other hand, if the Armor Piercing value of the weapon exceeds the Armor Rating of the armor the weapon does an additional 25% damage for each level that it exceeds the Armor Rating. Therefore, if the bone gloves' Armor Rating of Light defended against the CDEF pistol's Armor Rating of None (fig. 2), damage is reduced by 50%. 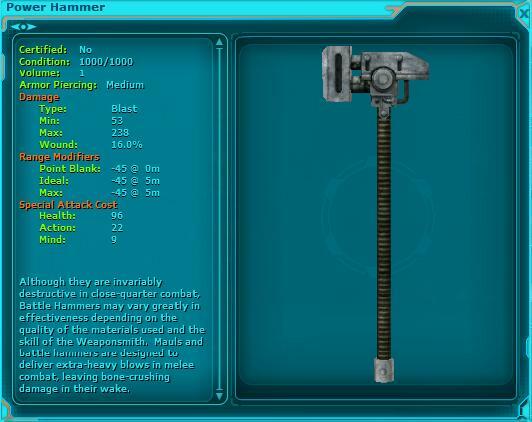 But in the case of the power hammer (fig. 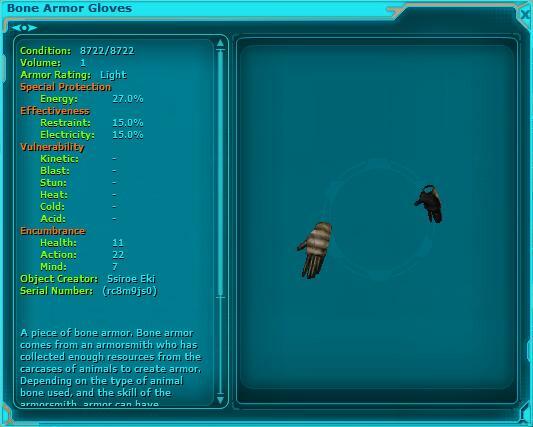 3), the Armor Piercing level is higher than that of the gloves. The power hammer, therefore, does 25% more damage. Note that the 50% reduction or 25% increase is counted for each level. So if that CDEF is used against an AT-ST whose Armor Rating is Heavy, there would be a three level difference. Damage is reduced by 50%, then another 50%, and another 50% for a mere 12.5% of the initial damage. The armor's Effectiveness reduces the damage taken by its given percentage for each of the damage types listed. This is in addition to the amount reduced by Armor Rating as described above. The bone gloves have an Effectiveness of 15% which applies to both Restraint and Electricity damage types. The damage reduced by the armor's Effectiveness occurs after adjustments are made due to Armor Rating. Special Protections are values that supercede the Effectiveness. The bone gloves have a Special Protection of 27% against Energy. This means that whenever the armor is hit by Energy damage, it uses the 27% value instead of the Effectiveness of 15%. Although Special Protections are usually higher than the armor's Effectiveness, they can potentially be lower. In that case, the armor would actually be weaker against that Damage Type. Vulnerability denotes Damage Types in which the armor offers no protection whatsoever. The bone gloves have quite a few of these: Kinetic, Blast, Stun, Heat, Cold, and Acid. Whenever the armor is hit by one of these Damage Types the damage done by the weapon is neither increased nor decreased. It is as if a weapon with an Armor Piercing value of None is used against a target with an Armor Rating of None. Unarmored Player Characters are considered 'vulnerable' to all damage types. Encumbrance describes the reduction of secondary statistics that occurs when the armor is worn. This reduction does not affect the primary HAM pools. This means that the bone gloves, which have a Health Encumbrance of 11, reduce a character's Strength and Constitution by 11 points. If the Encumbrance is such that it would reduce a stat below 1, the piece of armor may not be worn. The bone gloves are struck by the CDEF pistol for 30 base points of damage. 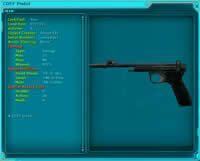 Because the weapon causes Energy damage, which is not one of the armor's vulnerabilities, the armor's protections apply. An Armor Rating of Light vs. an Armor Piercing of None results in a 50% reduction, dropping damage down to 15. The bone gloves have a Special Protection vs. Energy of 27%, resulting in a reduction of 27% of the 15 or 4 points. Since 11 points of damage made it through, the armor's current Condition drops slightly with the maximum Condition staying at 8722. Not all Damage Types are created equal. Some Damage Types are far more commonly encountered than others and armors as a whole tend to fare better against some types than others. While there's no steadfast rule for this, here are some general trends. These tend to apply to both players as well as creatures. (Note that these are not in order of importance; the type of damage you receive can vary greatly depending on your particular situation). Kinetic is most common form of melee damage. Most melee weapons and creatures do kinetic damage and since pets are so popular in PvP, having armor with kinetic resists can be very important. Most armor (both player and creature) offers at least some protection against this. Kinetic damage from ranged attacks is limited to a few projectile weapons. Ubese armor is the primary defense against Kinetic damage. Energy is the most common form of ranged damage. Rifles, most carbines, faction pets, and laser weapons all do energy damage. Be warned, however, as there are exceptions to this rule. Like Kinetic, most armor protects against this to some degree. Both Tantel and Bone armor provide special protection against energy damage. Blast is a moderately common form of damage. Most armor offers at least some protection against this form of attack. 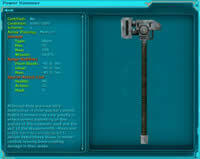 Commando special weapons and Power Hammers are the primary weapons that do Blast damage. Padded armor has special protection against this. Cold is a damage type that is used most commonly used in SG82 rifles and cryoban grenades. In practice, it is rare to encounter this. Along with kinetic and energy, heat is probably the most important damage type against which to protect in PvP. While only a handful of weapons use heat damage, they are frequently wielded. The flame-thrower, and the FWG5 pistol both do heat damage. Mabari armorweave's special protection is to heat. Acid is an important damage type as the scatter pistol and the DX2, both of which do acid damage, are commonly seen in PvP. Some creature attacks, the commando acid launcher, and the DXR6 carbine also do acid damage. While electrical is not a widely used damage type, the Lightning Cannon is a favorite among some bounty hunters. Composite armor's special resistance is electricity. Stun damage is the bane of armor, player and creature alike. Most armor is vulnerable to this Damage Type. 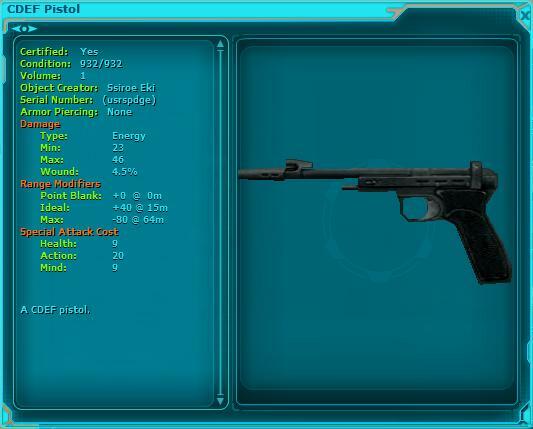 Fortunately, only a few weapons such as the jawa ion rifle and the tangler pistol deal stun damage. Fencers are also known to use stun batons. Is bone armor with 20% energy better than composite with 5% energy? Protection ratings are absolutes. A higher value is a higher value. Their meanings don't change based on the armor type. So in this case, the bone is better against energy. Although the maximum potential protection for composite is higher than bone, it is possible for lighter superbly made armor to protect better than a poorly made heavy one. I tried on some high level armor, and it had encumbrances so high, I couldn't wear it. Will I never be able to use that type of armor? Depending on the materials used and the skill of the smith, armor can provide better or worse protection, and impose higher or lower encumbrances. That encumbrance can be further lowered by a slicer. If you shop around, you may find lower encumbrance armor that you are able to wear, or get a slicer to slice your existing armor. Also, stat-boosting food, spice, and medicine can allow you overcome high-encumbrances. Be warned, though, as the Emperor has declared that Spices and sliced armor are both illegal. Is it a good idea to wear my armor all the time? Not if you do non-combat actions that use Health, Action or Mind. The encumbrances lower your secondary attributes, thereby decreasing your regeneration rate and increase the cost for using abilities. Do Personal Shield generators work the same as armor? Yes, they do. There are some differences, however. Shields have no encumbrance penalties and act as a second layer of armor. Damage is first absorbed by the shield and whatever remains goes to the armor. Shields also have an innate protection against Stun damage which no other crafted armor has. The trade off is that shields are extremely fragile. They wear out quickly, making it an expensive proposition to use them continuously. What species have restrictions to wearing armor? What is the difference between a Special Protection and Effectiveness? For most players standpoint there is no difference. Both Special Protection and Effectiveness are treated identically in combat. In armor crafting, Special Protection can usually be raised separately from and faster than Effectiveness. In addition, Special Protection is not raised by an Effectiveness slice. Back to Advanced Guides articles.